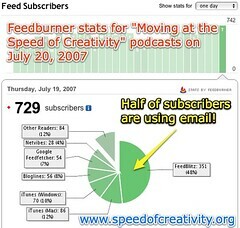 Moving at the Speed of Creativity | Email becoming irrelevant? Not for most teachers! Email becoming irrelevant? Not for most teachers! I renewed my Pobox.com account today and logged in to look at my spam settings. I didn’t make any changes to these settings, but I was surprised to see it permits blocking of ALL email originating from certain countries. In the continuing war against identity theft (promulgated by spammers and malware authors) I understand the drastic step of blocking ALL EMAIL originating from a particular country has and is being taken in some cases by network administrators. Until today I hadn’t seen a tool that let individuals make this “block all emails from country X” decision. The fact organizations and individuals both are and can make this sort of blanket decision suggests an emerging (or perhaps already existing) communications divide for people living in those countries. I notice, interestingly, the United States is not on this list, but Canada and Japan both are. How many people are choosing to block all email messages from those countries, or from others? For people or organizations who make this choice, that is an example of draconian discrimination to be sure. I would be interested to read those statistics, if they are available. The fact some folks are doing this at all suggests a trend (suggested by some) of email’s growing irrelevance. More and more, social networks are playing a bigger role on the mobile phone. In the last six to nine months, teenagers in the US have taken to text messaging in numbers that rival usage in Europe and Asia. According to market research firm JupiterResearch, 80 percent of teens with mobile phones regularly use text messaging. I still find email to be useful (certainly more-so now that I’m keeping my inbox clear with my iPhone) but other communication modalities are often better for me than email. Twitter and various other IM platforms (including Skype) now feature prominently on my daily information radar screen. Email is still there too, but the volume of spam is a major disincentive to me when it comes to actually LIKING email these days. Thankfully, tools like Pobox help that cause dramatically. How does email figure in your daily routine of consumption, processing, remixing and creation of information on a daily basis? 7 Responses to Email becoming irrelevant? Not for most teachers! I do something a little more slapdash than POBox.com (which I hadn’t known about until this, but I’m not surprised by it’s existence). What I use is a separate gmail account than the one I usually use. It’s free, and while I’m not able to selectively block anything like you can, it’s an entirely separate entity, so nothing gets through to my personal email. The problem, of course, is that nothing gets through to my personal email. I have to remember to check it, and don’t do it as often as I should, but I’m not missing much. For instance, most emails I get are from various companies I ordered from online–all of which require an email so you can place your order. Sure, I click the boxes to refuse their monthly mailings of special offers and corporate news, but in a few cases I’m getting the occasional email nonetheless. One bonus I’ve noticed from this is that the spamcatcher email has almost come to personify my personal presence on the internet. Here’s all the companies I’ve dealt with, all the sites (LJ, Flickr, RSS feeds, etc.) I’ve ever interacted with. It’s even the email I use for posting to blogs like this one. It’s not that I’m trying to hide, but going off of the general rule that I don’t give my email address to anyone I haven’t talked to in person, it provides an extra buffer of sorts. If I start collaborating with someone on the Internet, and I need to check daily to see if there’s an email from them, I’ll give them my personal email. It’s a little extra work, but it’s one way of doing things. And, since I’m a shameless cheapskate, I appreciate that it’s free. What I’m very slowly trying to get to is that, just as we still have “snail mail” and real life P.O. Boxes and fax machines and such, I imagine we’ll still have email for a good long time, mainly because it’s a very simple technology that’s hard to replace. You still need snail mail to send certain types of formal correspondences, packages, birthday cards, etc. P.O. Boxes do the same thing, except with an extra degree of distance as it’s digital counterpart. We could scan documents and email them, but faxing is still simpler, even if some picture quality is sacrificed–and it means not having to go out and buy a scanner. For the same reasons, email will probably live on. Now, we may stop getting our email accounts from Yahoo and Gmail and Hotmail and whatever the trendy sites are these days, and start getting them from Verizon and Palm and the like. People who use Comcast, I know, already get Comcast email accounts, and the same may apply to our cell phones and palm pilots and MP3 players, though all of these are already beginning to merge. Hardware changes, and changes often. You can merge your phone, music player, personal organizer, computer, e-book reader and 4-slot toaster as much as you like, and what the final product is may be recognizable, or it may not. Email has its competition–text messaging, for instance. There are programs like Pinger that let you use your cell phone to leave an audio email message. There are voice emails and video emails and all manner of varieties. But regardless of what the medium is and whether you’re typing, thumbing, writing with a stylus, speaking, miming or signing, it all needs a place to go. It could go to your phone number, true. But just as we hate to go to the mailbox because we know it’s all going to be junk mail, we go. We still get magazines and letters and the like. The strength of email is that it’s modeled after a VERY resilient concept–mail. Now, on the other hand, just as we dread what the mailbox may hold, we hate picking up the phone at dinner, because we’re sure it’s someone asking if we’re willing to take a short survey or the like. It’s audio junk mail, audio spam, and Skype and it’s many VOIP-style cousins are ways of getting around it. Maybe this means it’s better, maybe it’s just that the telemarketers haven’t expanded that far yet. We shall see. Thus, we’re left with two resilient technologies: email and phone. (Mail too, but let’s stick to electronic things for a second.) As email expands to audio and phones expand to text, what we may be seeing is the beginning of a truly impressive merger. After all, is sending a message (text, audio, video, etc.) to Emailaddress@TheInternet.com much different than sending a message (text, audio, video, etc.) to 123-456-7890? Probably not. We may call it pmail or something like that, but whatever we do call it, we’ll recognize where it came from. Whatever does happen, we can be sure of one thing, and one thing only: Students will try to use it in the middle of class. The problem with IM is that its like to telephone, it interrupts you right when you’re in the middle of something, like TEACHING school. 🙂 E-mail allows me to check my messages at my convenience not theirs. It can be great for just-in-time synchronous learning but for everyday business, sometimes a note or an e-mail works better. Although it is not always possible, some communications could be had in the most personal way, a face-to-face conversation. Kids dont use email because they dont work in companies. They use SMS because it appears to them to be cheaper. When they are working, this may all change. There is a role for email. This blog posting is interestingly timed. CBC (Canadian Broadcasting System) actually had a discussion about how the new generation of kids is not using email because of spam. Actually, they use email, but they do not consider it a reliable means of communication (mostly because they don’t check there spam discard lists). Rather, when they want to ensure someone gets the message they use instant messaging, text messaging (SMS), or facebook type stuff. I think if there was a “professional” version of Facebook style communication (where only mutually agreed upon friends can speak to one another), then email as we know it today will become obsolete. In essence, I think email needs to be redefined to give the receiver control over who can sent them messages. BTW, I too use pobox.com and highly recommend it. Whenever my local provider account gets too much spam, I just create a new account and use it. Pobox ensures that my friends can still reach me, since that is the address I give out. What’s cool about Facebook is long lost friends are now reconnecting with me. The pictures help them ensure that they are reaching out to the correct person.